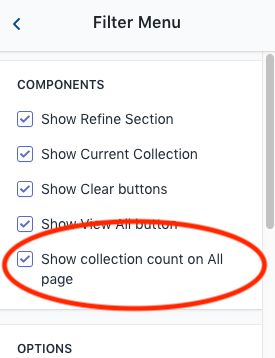 You can enable the collection counts in your theme settings, under Filter Menu. Note that the collection counts may not always show once you start applying filters. This is due to a limitation of the Shopify platform unfortunately, you can only show the correct collection counts when you have no filters applied as Shopify does not let you work out the number of products that are in a filter without it being applied yet. Note that you can show the counts with 1 or 2 filters applied by using the Replacer mode, and always on a group when using the Collection List mode.